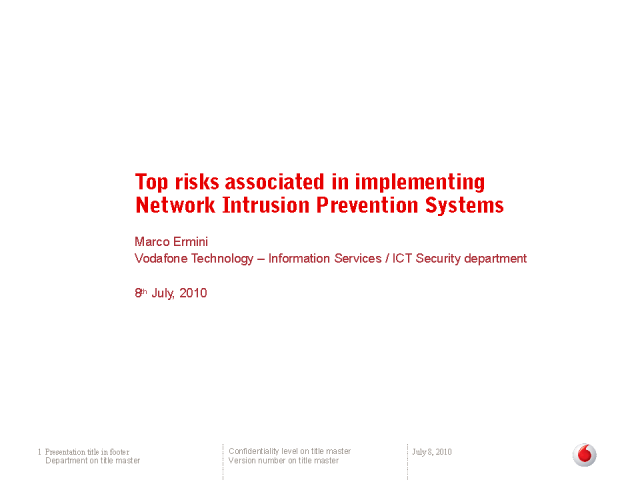 Marco will share his experiences, and the top risks he faced when implementing IPS at Vodafone. Marco is a Senior systems/network technical architect and administrator, programmer and security expert. With a degree in Math and Computer Science, a doctorate in Philosophy, Marco has over 10 years work experience in IT, 8 of which spent as a consultant on client's sites. Marco currently holds the post of Network Security Manager for one of the largest and innovative telecommunications companies in the world - Vodafone. Amongst his responsibilities, he is in charge of the engineering and deployment of the overall NIDS/NIPS infrastructure and network vulnerability scanners and database monitoring. He is responsible for the network security of the business which than spans 14 countries within the EMEA region.